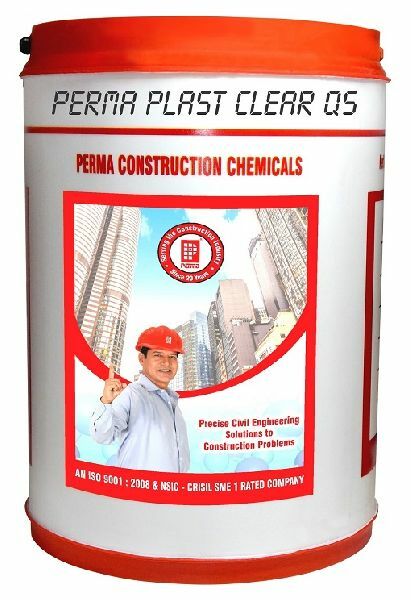 Perma Plast Clear QS is primarily used in the fast setting of the mortars and concretes. We are the renowned Manufacturer, Exporter and Supplier of the excellent quality Perma Plast Clear QS in the global market. The Perma Plast Clear QS that we provide is manufactured by using the high-grade materials and highly appreciated for its efficiency and performance. We make avail this Perma Plast Clear QS at very economical price. Direction for use : In case of shot-creting/guniting, perma plast clear QS is mixed in the gauging water in the required proportion before addition to the dry mix. Hence it can be successfully used in both dry and wet shot-creting processes. In concrete and mortars for precasting elements. Perma Plast Clear QS is dosed through a separate dosing tank fitted above the mixer. It can be dosed manually as well after addition of required water. Rebound losses in plastering mortar shot âï¿½ï¿½ creting and guniting are minimized. Saving on material, labor and machine time. Perma Plast Clear QS is liquid in form, hence easy to use. The plasticizing action of Perma Plast Clear QS helps in complete hydration of cement there by achieving superior strength. Wastage due to breaking in pre-cast elements is reduced savings on production cost. Perma Plast Clear QS can be used with all types of cements. To water proof plaster and concrete. Dosage : Required dosage of Perma Plast Clear QS has to be arrived at site by practical trials. The dosage is dependent on temperature conditions, type of cement, type of acceleration required. We however recommend dosages of 1 to 10 percent by weight of cement. Lower dosages are however used in precast elements and higher dosages are used in shotcreting. For waterproofing the minimum dosage of the product shall be 250 gms/50kg bag of cement.